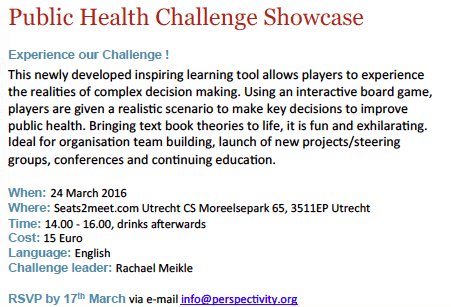 We would like to invite you to experience the Public Health Challenge March 24 in Utrecht. This newly developed inspiring learning tool allows players to experience the realities of complex decision making to improve public health. Read the invitation and flyer for more information. We hope to see you in Utrecht!